There is something very refreshing about black and white cards.......they always seem so fresh and crisp to me. When I saw the challenge at Our Daily Bread Designs this week was for black, white or cream I couldn't help but get one of their stamps out and play. I do have to confess that after taking this picture I decided to color the little berries red, then used a little crystal effects over them. I liked the little pop of red after doing that.....but since the picture was taken I decided to go with it as is - you'll have to use your imagination. I used some ribbon on the bottom for this one, I like this design so I am planning to make a set as a gift and will use a lovely Thank You sentiment on the bottom. This is a great stamp from Our Daily Bread Designs and I love that it has a matching die make - this makes it soooo easy to cut it out and pop it up. Has me thinking spring!! Also, in real life the rhinestones on the lattice really make this card look lovely. Where do I start. Ever since I saw the "Explosion Box" made by Kittie C on Splitcoast Stampers I have been itching to make one. I finally cleaned up my stamp area and sat down to play the other day. THIS is not the first box I created.....that will be posted a little later so not to ruin a surprise for a friend. After making the first box there were a gazillion ideas going through my mind.......something special for Easter just kept tugging at my heart....a box that holds a special gift reminds me of the great gift of Christ's birth at Christmas that culminates in the greatest gift of all when He dies on the cross so that I might live. While I wanted to use the acetate and have it look like there were things in the air as the box was opened, I just couldn't seem to grasp an idea for it - instead this is what I created!! I used three different stamp sets. The cross with a flower cut out and popped up on it is from Flourishes. From the get go I wanted a cross in the center and this one is the perfect size and can be cut out easily. The 'Alleluia' sentiment is Stampendous, and the perfect scripture quotes, as well as the frame and matching dies used around the sentiments are from Our Daily Bread Designs. I started by taking a 12 x 12 sheet of cardstock and scoring it at 4 inches on each side, then I cut out the corner pieces for a + shape. I got a little carried away on the inside layers, running one through my Grand Calibur with the Spellbinders M-Bossabilities to create a wood look, and backing it with a darker purple cardstock. For the outside I created my own patterned paper using the flower stamp from Flourishes. I topped the box with a small bow made with my NEW Becca's Bow Maker I recently purchased from Our Daily Bread Designs (I think I am going to enjoy using this on many future projects). The focal point in the center was the most fun. I colored my cross and flowers in with my Copics and then cut it out. I took some mirrored silver cardstock and took two of my circle dies, placing them so they cut slightly larger to the top and ran them through my GC. I cut two of these so I could sandwich a piece of vellum between them and form a frame - the cross was too messy looking from the back and needed to be hidden. Then I put some pop ups on the back of my cross and placed it on the vellum. For the base I took a small styrofoam ball and cut it in half....I used a knife to make an indentation across the top to place my frame and cross in. Some leaves cut from my Cheery Lynn die and a few flowers from my Martha Stewart punch were added to the top of some moss I glued over the styrofoam....I also added a few dollops of glue and put a little touch of Flower Soft on my moss. This project was just toooo much fun - I am hooked just wait until you see the other box and the one I am planning next....lets just say 'Yee Haw' for that one. ! A friend and I had a little friendly 'throw down' this past weekend. She challenged me to find a card I have 'pinned' and use it for inspiration to make my own. The biggest challenge there was not getting distracted as I went through the many I have pinned for inspiration. There was one (here) however that stood out. I originally pinned it because I liked the way it opened....a square card, but the flower is the top layer underwhich the sentiment is placed. Just that day I had used the last of the gift card my DH gave me at Christmas to Michael's and purchased this Jumbo Dahlia. It is a little larger than the inspiration flower, but it worked just fine for me and I will be making more of these in different colors. The overall card is 5.25 x 5.25 - I had to use my Grand Nestabilities and circle cutter for the layers. The flower is on pop ups on top of the scalloped layer. I am going to enter this in the challenge at Oozak since it is colored with my Copics - R81, R83, R85, R43. I have to tell you I am really excited.....the Intermediate Copic Certification class is being held in Georgia in April. Since getting my certification in Missouri before moving I have been impatiently waiting for the second class to be close enough to take. 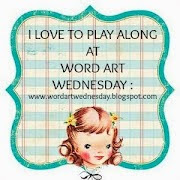 Even more exciting is I let a friend on Splitcoast Stampers know about it (its being held in her area, an hour from me)....we have been trying to meet for many months. Turns out she has been waiting for the class as well and jumped on the opportunity to sign up....not only do we get to meet, but we get to take the class together. Can't wait. 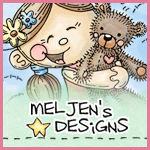 This is the image from Meljen's that I used for this weeks challenge. Lately I have been into coloring and using 3-D effects on my cards and that is what I did with this weeks image. I colored the base image. Then I colored a second image and cut out the apple, and leaf. I then used some pop ups to place that apple over the first. But more was needed, so I colored a third image, and fussy cut out the little worm on the right and the heart. I mounted the little worm by cutting him a little longer and inserting him into a slit I had cut on the second image so he would look like he was coming right out. The little pink heart is also popped up. A cute little card that I look forward to sharing with a friend.